June 22, 2013 - On Friday about 1:40 PM a Cessna 172 departed Oakland County International Airport (KPTK) Pontiac, Michigan for a pleasure flight with four onboard. Upon takeoff at or about 100 feet above runway 9 the pilot reported to air traffic control that (aircraft) “we’re a little over weight ... we’re going to have to come back and land”. The aircraft crashed killing all onboard. The pilot, 19 year old Troy Brothers’ intention was to take his family up for a pleasure flight before he left to the U.S. Naval Academy. Onboard the 172M Skyhawk, N9926Q, were his mother Sandra Haley 53, his step dad James Haley 58 and his brother in-law Jaime Jose 34. The aircraft owned by Flight 101 LLC, a flight school located at the airport, was destroyed and consumed by fire when it crashed in a field at the end of the 5,600 foot runway north end of the airport. The pilot and the other two males were pronounced dead at the crash site. The pilot’s mother, Sandra Haley was airlifted from the scene and pronounced dead at a Pontiac hospital. Airport officials shut the airport down for about 2 1/2 hours following the crash. 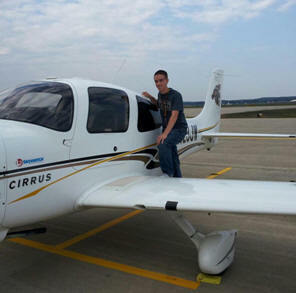 Troy Michael Brothers of Fraser, Michigan had just received his private pilot’s license on May 2, 2013, for a single engine land aircraft. The night before the crash, Brothers celebrating his birthday came up with the idea to take the family up for a pleasure flight the next day as he would be leaving for the Naval Academy. The aircraft was powered by a Lycoming 0-320 series engine of 150 horsepower to 160 horsepower. This aircraft was most likely powered by a 150 HP. For arguments sake this aircraft should have been able to carry four adults if proper weight and balance calculations were performed. Taking into account fuel onboard, weather conditions (density altitude), weights of adults and any baggage brought onto the aircraft. In most cases a flight like this would require the aircraft fuel tanks to be less than full on takeoff. However, an aircraft this size with four adults is not a good start. Weight and balance calculations would determine the maximum fuel that could be carried in the tanks of this aircraft at takeoff. The NTSB has begun its investigation and it most likely will center its investigation on this aircrafts takeoff weight. In general this aircraft has a Gross Weight of 2300 lbs with an Empty Weight of 1335 lbs. It can hold 42 gallons of fuel. This Cessna 172 Skyhawk was a four seat single engine fixed high wing aircraft which was manufactured in 1975, by the Cessna Aircraft Company. This particular model, the Cessna 172M was manufactured between 1973 and 1976. The aircraft gained a drooped wing leading edge for improved low speed handling. This was marketed as the "camber lift" wing. In 1975 the Cessna 172M model sold for US$16,055. Cessna made a total of 7306 "M" models over the four years it was manufactured.